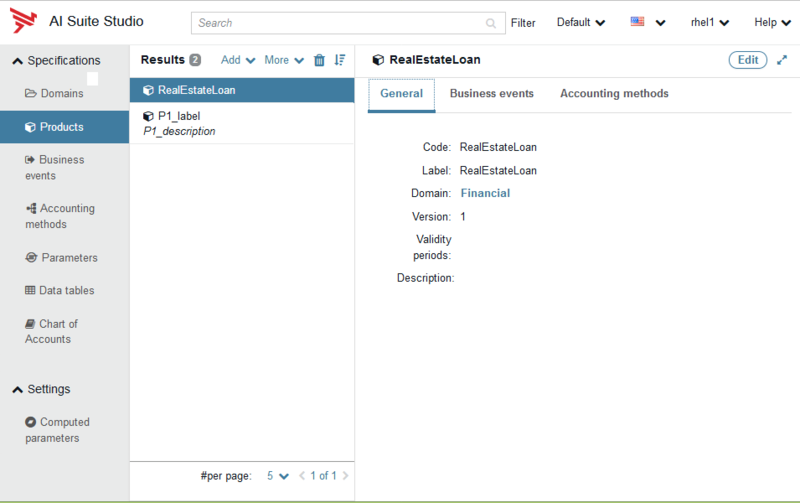 The left pane lists the object types that AI Suite Studio uses to link top-level business categories to Products, Business events, Accounting methods, and actual movements on accounts. Domains are the top-level business categories. Products are the products offered by the company, such as loans, savings accounts, etc. Business events (sometimes referred to as events) are the state changes that rhythm the life of those products: open account, pay installment, make deposit, close account, etc. Parameters determine values, describing the properties of movements. They are created at configuration import and their values can be retrieved from a Data table. Data tables and Charts of accounts can be imported and associated to the documentation to provide additional information to the users. Click Product, then select a product in the list shown in the middle pane. On the General tab, you can see some information about the product, and links to reference documents relating to the product. In the right-hand pane menu, click Business events. A graph appears, illustrating the role each event successively plays in the life of the product. Below is an example. comments in italics provide explanations about the different action rows. 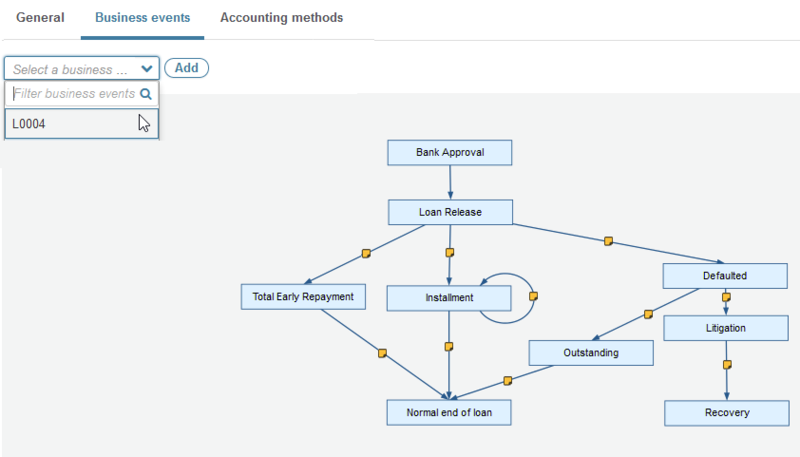 Click in the Select sample list box to view the list of samples associated with the Accounting method. Each Accounting method can be triggered many times in a day, but AI Suite Studio selects a minimal set of samples from the latest exchanges, to illustrate the action of methods associated with a Product. One method can be associated to several samples, in the case where different conditions can trigger different movements. For example, purchases above a certain sum may trigger specific procedures. Each sample is represented by an order number, the event label and the execution date. Try clicking in the headers of the tables. This opens a ribbon with further information about the table columns. Also if you click on the other cells of the table, the ribbon will display more information. To open/ close the ribbon use the chevron icon . Toggle the link Hide all / Show all to respectively open / close all Accounting methods.